Schneider Electric specializes in energy management and automation. In addition to that, they specialize in manufacturing of electric accessories of all sizes. From basic home appliances to large-scale machines in power plants. Given the fast-paced development of the industry, keeping up with newest trends and innovations is key, which means Change in Production projects have to be optimized and managed effectively. Before implementation of Easy Project, the project management in Schneider Electric was done using Excel sheets, Outlook e-mail client, noticeboards in meeting rooms and endless meetings. The downsides of these tools are well known. Excel sheets, even when they are shared, do not allow simultaneous editing. In addition to that, Excel offers poor visualization of the plan and available capacities. Outlook lacks organizational features that would allow to manage issues discussed over emails. Furthermore, Outlook does not allow users to easily share and control the information. If someone is not included in a particular e-mail list, he/she has no information. While noticeboards have their definite benefits, for example, they are great for brainstorming sessions and increasing creativity, they also have their limitations. Noticeboards are not the best suitable tool for up-to-time information sharing, they lack centralized shared dashboards with a complete overview and status updates with the latest news, which would be of utmost importance for project meetings. Three project management software solutions were under consideration in Schneider Electric: Easy Project, MS Project, and Jira. Easy Project was chosen as the best solution because it met all company requirements. The second criterion for choice was the usability and overall user experience, in which MS Project underperformed. Last but not least, value for money was also of great importance, making Easy Project the definite winner for Schneider Electric. Change-in-production projects are very challenging since they normally come with strict guidelines and time limits. Changeover has to run smoothly and with minimal downtime for the machinery, with all depending process diligently planned. Implementation of Easy Project commenced with the basic setting of the software and workshop training of the key users on site. From there, implementation can be split into two big steps. Firstly, the best-suited project template for change-in-production had to be customized to fit Schneider Electric needs. The goal was to create a template that would give the best overview of all the process of the changeover. Together with Schneider Electric, we created several templates, which were analyzed and tested using pilot projects and the best fitting solution was chosen for implementation. Secondly, Easy Project had to be customized to fully meet needs of Schneider Electric. For example, documents module had to be completely restructured and full-text search was expanded to meet the needs and fit Schneider Electric's use cases. After successfully completing this milestone, Easy Project was presented as the best practice for management of changes in production in the whole of Schneider Electric Group. Implementation of Easy Project as a unified solution across all of Schneider Electric locations is currently under discussion. Furthermore, some of Schneider Electric Group subsidiaries have already reached out to us independently, once again showing that Easy Project is a solution that is responsive to needs and requirements of the client. Change-in-production is a very specific type of project. If organized well, this type of project should keep the downtime of production machinery to a minimum. Well-organized change project eliminates mistakes and brings the company a competitive advantage in a form of product innovation, with fasted release and innovation cycles. It is crucial to bear in mind that change-in-production projects are also very demanding. Over the years Schneider Electric has developed a standard procedure, which we integrated into their Easy Project solution. Easy Project templates include all the necessary steps and logical connections. These templates save time and provide guidelines to standard change-in-production processes while allowing personnel to focus more on the specific requirements of a particular project. Due to the fact that change-in-production projects are regular in Schneider Electric and must fulfill standard requirements and legislative regulations, project templates is the ideal solution. Project template includes all the tasks, milestones and deliverables, which provide guidelines to the team while allowing them to focus more on the business value of the project. Project overview dashboard is a very powerful tool. After defining this template once, it can be effortlessly applied to every project. 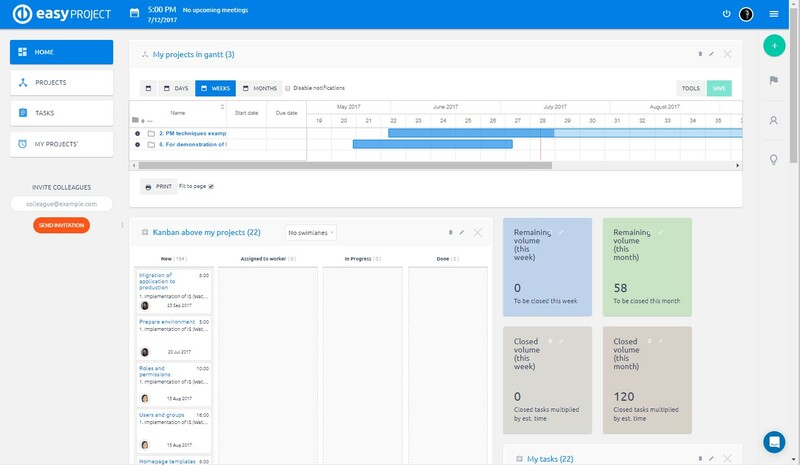 With project dashboard yo get an instant overview of key metrics and documents relevant to the specific project. 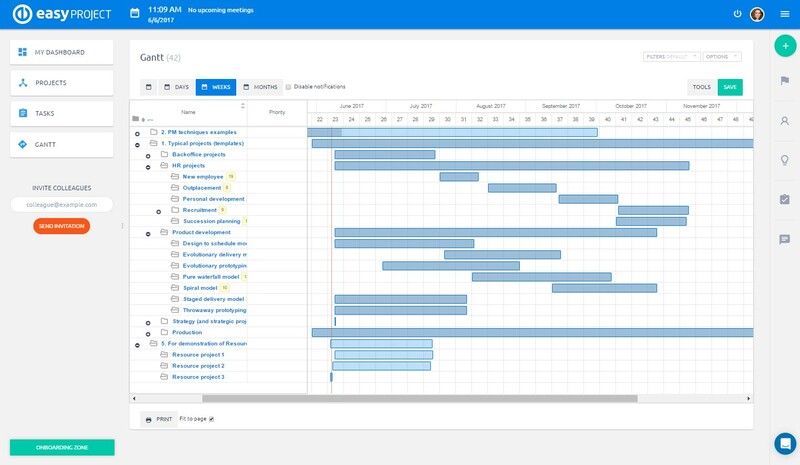 Easy Gantt is a great tool for visualization of your project timeline. 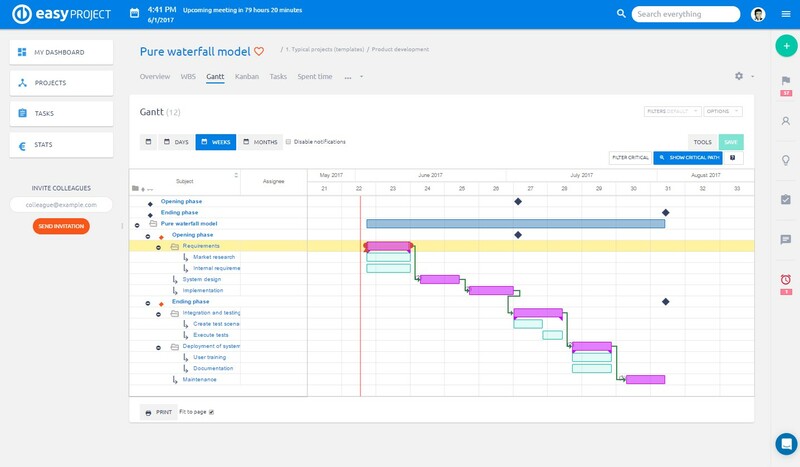 In one glance you can see at which stage is your project, you can see how complex is a particular project and you can instantly see if the project is running smoothly and according to the set timeline.